Perform basic Display, Edit and X-scale functions on your data, basic Operations such as Scale or Normalize, or analysis Functions such as Avareage or Sum. Use NeuroMatic’s Channel & Wave Select Controls (7) to select the channel (e.g. “A”) and set of waves you wish to analyze (e.g. “All” or “Set1” or “Group0”). >> Basic Wave Details are now listed at the bottom of the Main Tab. Values for the x-axis start, “delta” sample interval and label can be easily viewed and changed here. Table – make a table of selected data waves. XLabel – set the x-axis label of selected data waves. YLabel – set the y-axis label of selected data waves. Print Names of selected data waves to Igor’s History Window. Print Notes of selected data waves to Igor’s History Window. Move selected data waves to another NeuroMatic data folder. Copy selected data waves to the current NeuroMatic data folder, or to another NeuroMatic data folder. Save selected data waves to a hard disk drive. Kill – delete selected data waves from the current NeuroMatic data folder. Note, waves displayed in graphs or tables cannot be deleted. Concatenate selected data waves into a single wave (1D or 2D). Split selected data waves into smaller waves. Delete Points from selected data waves. Insert Points into selected data waves. Align selected data waves using a wave containing x-axis alignment values. For example, if your selected data waves each contain an EPSP, and you want to align the EPSPs on their peaks, use the Stats Tab “All Waves” function to compute the “Max” of each EPSP, then select the Stats wave ST_MaxX0_RAll_A0 (which contains the time of the max values) for the wave of x-axis alignment values. This function will then set the x-axis “Start” variable of each selected wave to the wave’s corresponding value in ST_MaxX0_RAll_A0. To remove the alignment, select the StartX function and enter 0. StartX – set the x-axis “Start” value of the selected data waves. DeltaX – set the x-axis “Delta” value (i.e. sample interval) of the selected data waves. XLabel – set the x-axis label of the selected data waves. 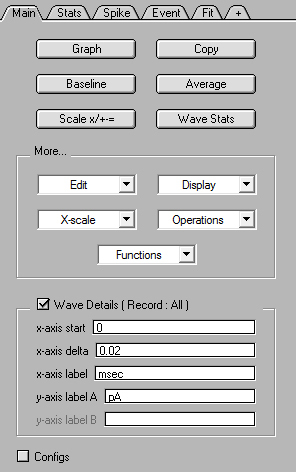 Xwave – choose a wave that contains the x-scale values of your data waves. This wave should have the same dimensions as your data waves. To use the default x-scaling of your data waves (i.e. the Start and Delta variables) select “No Xwave”. Resample selected data waves by up-sampling or down-sampling (see Igor’s Resample function). Decimate – reduce the number of points in selected data waves by linear interpolation (see Igor’s Interpolate function). Interpolate – perform linear or cubic-spline interpolation on selected data waves (see Igor’s Interpolate function). Continuous – set the x-axis Start value of each wave so they appear continuous. Episodic – set the x-axis Start value of each wave to zero. sec, msec, usec – switch between these time-scale dimensions. Scale by a Value – scale selected data waves by a number (operations x / + - =). Scale by a Wave – scale selected data waves by another wave of the same dimension (point-by-point scaling) or by a wave containing scale values for each wave (operations x / + - =). For example, if your selected data waves each contain an evoked EPSP, and you want to scale the EPSPs so their peaks are normalized to one, use the Stats Tab “All Waves” function to compute the “Max” of each EPSP, then select the Stats wave ST_MaxY0_RAll_A0 (which contains the max values) for the “wave of values” and the “/” operation. This function will then divide each selected wave by the wave’s corresponding max value in ST_MaxY0_RAll_A0. Rescale – change the y-scaling of your data. For example, you can use this function if you want to change the y-scaling of your data from “V” to “mV”. NeuroMatic will scale your data by 1000 and change the y-scale label to “mV”. Baseline – subtract an average baseline value from selected data waves. Normalize selected data waves between a min and max value. dF/F0 – scale selected data waves so they represent the fractional change (dF) relative to a baseline value (F0). Smooth selected data waves (see Igor’s Smooth function). FilterFIR – lowpass, highpass or notch filter selected data waves (see Igor’s FilterFIR function). FilterIIR – lowpass, highpass or notch filter selected data waves (see Igor’s FilterIIR function). Integrate selected data waves (see Igor’s Integrate function). Differentiate selected data waves (see Igor’s Differentiate function). 2-Differentiate – double-differentiate selected data waves (see Igor’s Differentiate function). Reverse data points in selected data waves. Rotate data points in selected data waves (see Igor’s Rotate function). Sort selected data waves by a sortKeyWave (see Igor’s Sort function). Replace Value – replace all instances of a data value with another data value in selected data waves. Use this function, for example, to replace all NAN’s with 0’s. Delete NANs – delete points from selected data waves that have NAN (Not-A-Number) values. Blank events such as stimulus artifacts. Clip events such as stimulus artifacts. Wave Stats – compute basic statistics (average, standard deviation, sum, min, max, etc.) of selected data waves. Statistics are saved in waves that are displayed in a table or printed to Igor’s History Window (see Igor’s WaveStats function). Average – compute the average and standard deviation (or standard error or variance) of selected data waves. Results are stored in waves beginning with “Avg”, “Stdv”, “Sem” or “Var”. Sum – compute the sum of selected data waves. Results are stored in waves beginning with “Sum”. SumSqrs – compute the sum of squares of selected data waves. Results are stored in waves beginning with “SumSqr”. Histogram – compute a histogram of selected data waves. Results are stored in waves beginning with “H_”. Inequality – perform an inequality test on y-values of selected waves (y > a, y < b, a < y > b). Results are stored in waves beginning with “I_”.